For decades, there has been scientific consensus that temperatures above 80 degrees produce harmful physiological effects that decrease work efficiency and output. According to the National Clearinghouse of Facilities, poor thermal conditions have also been shown to negatively impact student and teacher morale and performance. No child should have to deal with extreme classroom temperatures that are not conducive to learning and may pose a serious health risk. The closure of schools because of intemperate weather is a reminder of the significant facility issues that confront all public schools. 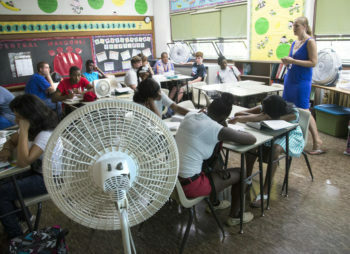 In an era of increasing temperatures, longer summers, and harsher winters because of climate change, the problem of extreme temperatures in the classroom won’t go away anytime soon. In fact, it will likely continue to get worse. It’s imperative that we ensure that classrooms are optimum learning environments. Passage of temperature control legislation would avoid the minute-by-minute waffling that too often occurs when districts are thinking of closing schools because of the weather. It would transform an opaque process and make it more transparent for all constituencies: parents, teachers, principals, administrators and students. Show your support for much needed temperature control legislation by signing our petition!